On August 25, 1946 the Blue Angels transitioned to the Grumman F8F-1 Bearcat and introduced the famous "diamond" formation. The Grumman F8F Bearcat fighter (affectionately called "Bear") was an American single-engine Naval fighter aircraft of the 1940s. It went on to serve into the mid-20th century in the USN and other air forces, and would be the company's final piston engined fighter aircraft. Designed for the interceptor fighter role, the design team's aim was to create the smallest, lightest fighter that could fit around the Pratt & Whitney R2800 engine (carried over from the F6F Hellcat). Compared to its predecessor, the Bearcat was 20% lighter, had a 30% better rate of climb and was 50 mph (80 km/h) faster. 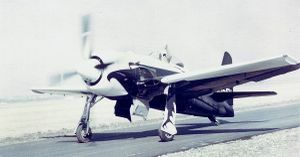 In comparison with the Vought F4U Corsair, the initial Bearcat (F8F-1) was marginally slower but was more maneuverable and climbed faster. Its huge 12' 4" Aero Products four-bladed prop required a long landing gear, giving the Bearcat an easily-recognized, "nose-up" profile. For the first time in a production Navy fighter, an all-bubble canopy offered 360-degree visibility. Many features of the Bearcat's design were inspired by a captured Focke-Wulf Fw 190 fighter that had been handed over to the Grumman facilities. The Bearcat's primary missions were to outperform highly maneuverable late-model Japanese fighter aircraft such as the A6M-5 Zero, and to defend the fleet against incoming airborne suicide (kamikaze) attacks. Grumman's project pilot for the Bearcat series was legendary test pilot Corky Meyers, who also had this role on the F6F Hellcat, F7F Tigercat, F9F Panther, XF10F-1 Jaguar, and the F11F Tiger series. Meyers was head of Grumman Flight Operations at Edwards Air Force Base from 1952–56. Besides the test pilot, "Corky" Meyers, another famous name is associated with the type; when asked his favorite aircraft to fly, Neil Armstrong's immediate and unequivocal answer was, "Bearcat." 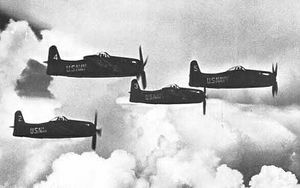 Postwar, the F8F became a major US Navy fighter, equipping 24 fighter squadrons. Often mentioned as one of the best (if not the best) handling piston-engine fighters ever built, their performance was such that they even outperformed many early jets. Its capability for aerobatic performance is borne out by the choice of the Bearcat for the Navy's elite Blue Angels in 1946, who flew it until the team was temporarily disbanded in 1950 (during the Korean War). The Grumman F9F Panther and McDonnell F2H Banshee largely replaced the Bearcat in USN service, as their performance and other advantages eclipsed piston-engine fighters. Other nations that flew the Bearcat included the French and Thai air forces. French aircraft saw combat service in French Indochina as fighter-bombers in the early 1950s. A small number of Bearcats survive: approximately 11 are airworthy, eight are restored for static display and approximately a dozen more are wrecks or restoration projects. Bearcats have long been popular in air racing. 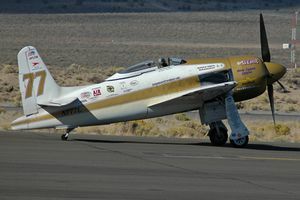 A stock Bearcat sponsored by Bill Stead won the first Reno Air Race in 1964. Rare Bear, a highly-modified F8F owned by Lyle Shelton, went on to dominate the event for decades, often competing with Daryl Greenamyer, another famous racer with his own Bearcat victories and a Bearcat world speed record. Rare Bear also set many performance records, including the 3Km World Speed Record for piston-driven aircraft (528.33 mph (850.26 km/h), set in 1989), and a new time-to-climb record (3,000 meters in 91.9 seconds, set in 1972, breaking the 1946 record cited above). ↑ Meyers,Corwin. Corky Meyer's Flight Journal: A Test Pilot`s Tales Of Dodging Disasters-Just In Time. North Branch, Minnesota: Specialty Press, 2006. ISBN 1-58007-093-0. ↑ Jane, Fred T. "The Grumman Bearcat ." Jane’s Fighting Aircraft of World War II. London: Studio, 1946. ISBN 1-85170-493-0. p.233. Jane, Fred T. "The Grumman Bearcat. "Jane’s Fighting Aircraft of World War II. London: Studio, 1946. ISBN 1-85170-493-0. p. 223. Maloney, Edward T. Grumman F8F Bearcat. Fallbrook, CA: Aero Publishers, 1969. ISBN 0-8168-0576-8. Taylor, John W.R. "Grumman F8F Bearcat." Combat Aircraft of the World from 1909 to the present. New York: G.P. Putnam's Sons, 1969. ISBN 0-425-03633-2. This page was last edited on 6 March 2007, at 07:32.